through adolescent (onset of puberty) care only. Follows the latest CPR guidelines. Injuries are the number one health problem for children in the US and they range from simple cuts and bruises to life-threatening emergencies. 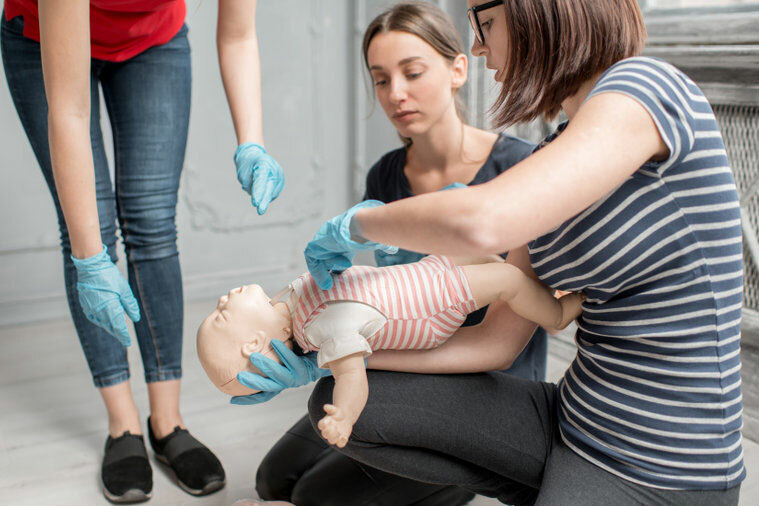 After completing our pediatric first aid certification course you will have the knowledge and confidence to respond to many different types of pediatric emergencies. Whether the child is injured or experiences a sudden illness, you will be able to help him/her until appropriate help arrives or the child is seen by a healthcare provider. Your skills in pediatric first aid may save a child's life. A video demonstration of the pediatric CPR process offers easy to follow guidelines for proper pediatric CPR procedures according to the latest updates and recommendations. Whether you are a child care provider, a teacher, a camp counselor, foster parent, coach, youth counselor or anyone involved in caring for children, a pediatric cpr or certification course will be valuable. You will gain the knowledge and confidence to take the appropriate action in case of an emergency. Choking - includes clearing the airway and abdominal thrusts. To register for the online Pediatric First Aid Certification Course, please create an account or login.